The Brookwater Design Studio features in the prestige Brookwater development which is located in Brisbane’s leafy western suburbs. Brookwater has provided to be the ultimate template to display Sustainable’ strengths of adding value to raw, dramatic topography and creating long term net worth through interpretation of sensitive design and Sustainable House Construction. The spectacular site is the inspiration for this striking designer home, with the dramatic slope of the terrain providing the basis for the innovative architectural design. The site also offers passive solar and cooling elements and maximum use is made of these to enhance living conditions while making the residence economical and energy efficient. Sustainable re-used the soil extracted from the foundations within the site to create the least possible disturbance to the surrounding environs. This is further enhanced by home’s feeling of hanging high among the natural forest and merging with the landscape. The stunning effect for visitors and passers-by is that of a home which has grown from its site like a native plant from the earth. The project was built with the belief that a home should be a monument of individualism, a place of refuge and also a solid family foundation. 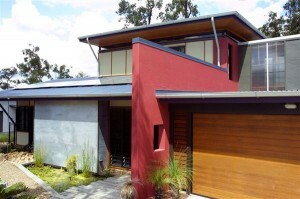 The Brookwater Design Studio reflects these beliefs through Sustainable House Construction by consisting of as few rooms as possible without becoming one large common room. Family life is centred around the breath-taking living areas with the slumber areas providing a pleasant and restful experience. The Brookwater Design Studio’s colour schemes are inspired by the local native area and reflect the belief that colour inspiration derived from nature provides the most pleasing and timeless exteriors and interiors. The home bears the Sustainable trademark of being uplifting and comforting – soothing for day-to-day living but consistently inspiring for the people who live within. The Brookwater Design Studio encapsulates the best that Sustainable has to offer with its innovative sustainable architecture design and strong synergies with nature, particularly the site and the surrounding environment. It highlights to all who visit that a stylish Queensland lifestyle is attainable without diminishing the amazing beauty of our native landscape and environment.